You would have had to have been living on the planet Mars for the last ten years to have failed to have absorbed these two frequently given pieces of advice. So why am I writing an article (this one) encouraging people to do just these things? In our stop whistle series, we are working through the stages of installing a good set of ‘brakes’ in your dog. [wp_ad_camp_1]To become really proficient at any skill, and to remain so, requires practice. For dogs just as much as for people. Almost every type of ‘stop whistle practice’ exercise has some disadvantage if carried out repeatedly. So we need to provide the dog with a variety of exercises. We also need, occasionally, to practice real life scenarios. And there will come a day, when your dog is racing towards you, when you change your mind and need to stop him. So it makes sense to practice this from time to time. A patterned exercise is simply one that alternate between different options. Sometimes the purpose of this ‘alternation’ may be to make the exercise more interesting, sometimes it may be to prevent some of the problems that will arise with repetition. The patterned recall is one such exercise. In the patterned recall, the objective is to practice a ‘stop on the recall’. But stopping the dog on every recall might adversely affect the recall, so instead, we only stop him on one in every three recalls. 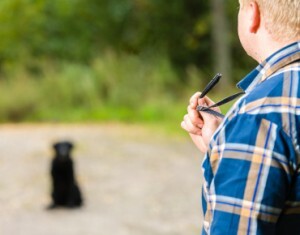 With this kind of exercise, controlling the variables/distractions etc, to the dog is important. Recalling the dog in a controlled situation is most convenient if we simply sit the dog up, and walk away a few yards before calling him in. But this means calling the dog from the stay. So, to avoid making the dog unsteady on the stay, we need to return to the dog twice as often, as we call him up. As you can see, the final part of the exercise is the same as the first. The ‘stop’ takes place on only one of the three recalls, and each recall is sandwiched between two stays where you return to your dog to ensure steadiness on the stay. Won’t the dog predict which is which? Your dog will certainly begin to predict what you are going to ask him to do if you always carry out this exercise in the same way. You can, and should, practice the components in a different order, at different training sessions, but should not alter the proportions or ratio between them. So there you have it – the patterned recall, a way in which you can practice a ‘stop on the recall’, without making the recall sticky and without unsteadying your dog. Obviously, you should not attempt this kind of practice until you have actually taught your dog to stop on a recall, and to sit and stay whilst you walk 20 yards away. And you need to observe the effects in your dog. Some dogs will need an even greater proportion of full recalls to keep their recall fast and keen, than the proportions given in this exercise. Hello Pippa, I am a ‘reasonably experienced amateur’ who has trained my last thee retrievers up to a decent standard. I am very impressed by your website and the really sensible information. I have got a new pup who is coming along well. She is 4 months old. The main concern I have is that for the first time in my experience she is not keen to get into the car/pick up to travel. I am introducing her to short journeys, with fun and interest at the end. I have just started feeding her in the back of the pick up to associate it with pleasant things. Do you have any other advice, please? All my previous dogs have been SO keen to get into the vehicle and I don’t think I have done anything differently. I think you are going the right way Alasdair, all meals in the pick-up, as many short journeys as you can possibly fit into each day. Lots of frequent short spells in the car without going anywhere to begin with if she is really upset by the vehicle. An edible reward waiting for her in there everytime you put her in, and she will soon forget her worries.